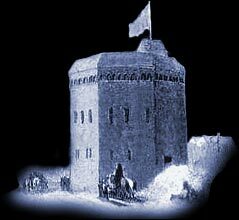 The Curtain Theatre amphi-theatre opened in 1577 in Curtain Close, Finsbury Fields, Shoreditch. The Curtain was the second such public playhouse (after Theatre) to be built in London . Henry Lanman was a theatrical entrepreneur and was responsible for its creation. He was also Theatre's manager until 1592. A number of companies performed at Theater including the Chamberlain's Men (William Shakespeare was known to have played at Theater whist his acting troupe was waiting for the Globe to be built). The amphi-theatre was in use from 1577 to 1622, and it may have remained standing until the mid-1660s. The history of Theatres that were prominent during the life of Shakespeare is fascinating and we have provided the London Map detailing Theatres that Shakespeare would have most certainly known and visited and quite probably have acted in. We have researched the history and locations of many of these theatres and plotted their locations into a modern Map of London. The names of many of these theatres still live on in London as they are reflected in the names of many current London Roads. Although we are born in bred in London we were not aware of this. We were amazed to find a ' Curtain Road' on the exact site of the Curtain Theatre. These links with the past and Shakespeare's London are endless.